This was one of the first conversations I had with Randy, my then boyfriend now husband, when I saw him make up a monstorrous bowl of cookies and ice cream for the first time. I had never seen such a huge serving. The man loves his sweets like no one I know and it’s slightly comical that he married a woman who avoids desserts on most occasions. 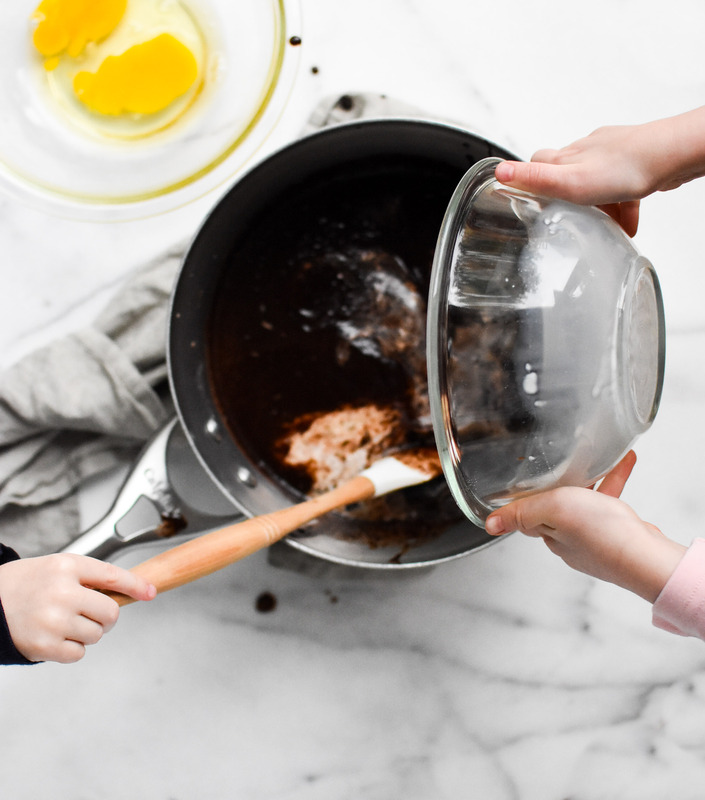 The apples don’t fall far from the tree– our children have inherited his love for sweet treats. With each fall season I find myself more in the kitchen baking goodies to feed my people, because of their love for sugary sweets. Their squeals (yes, even Randy’s) of anticipation and excitement fill my heart. With each successful bake, my level of baking confidence rises and I want to do it more. 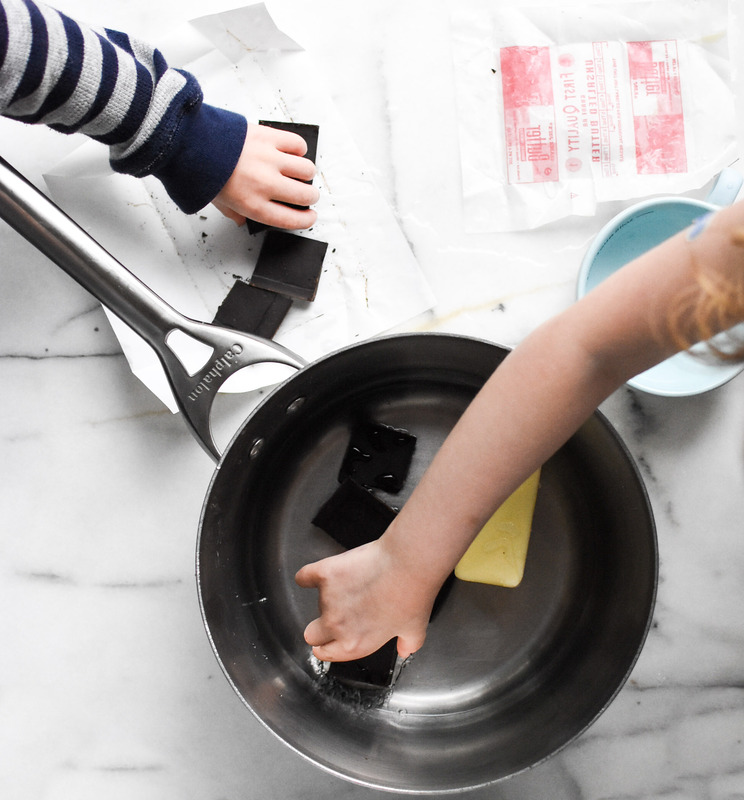 When I develop desserts my children are more interested in it than when I work on savory meals. They want to be a part of the whole process, so I engage them in their interest through questions. While driving to Market Street the questions begin “Mommy is making pumpkin bread this week– what ingredients do I need?” “Pumpkin!” Yes! “Chips!” Maybe not with this one. patience “There’s raw egg in the batter, we have to wait to taste it.” It also harbors an academic environment– math (measuring out ingredients), science (how different ingredients create particular results) and artistic expression (what would you put in the bread?). Kitchen and kids. The two go together. After an afternoon of baking the house smells of cooked pumpkin and apple. It greets Randy as he walks in from work. 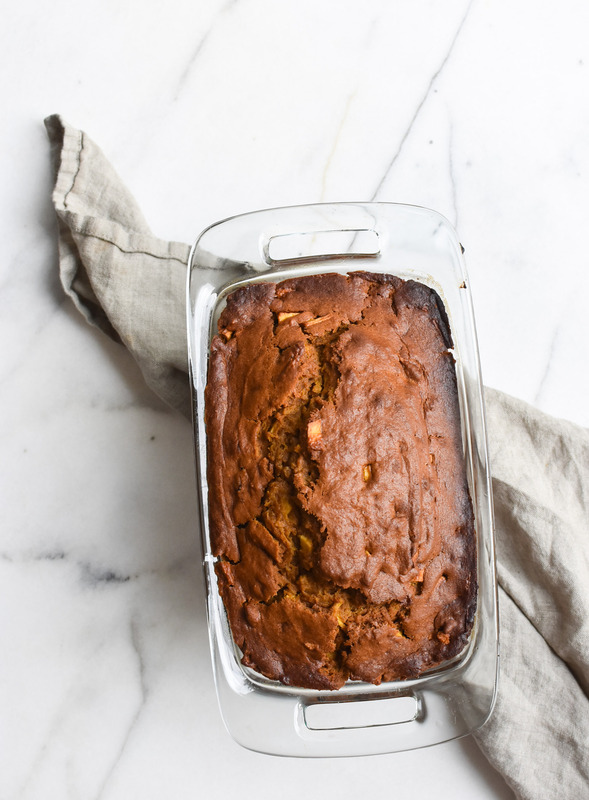 Browned Butter Pumpkin Apple Bread. 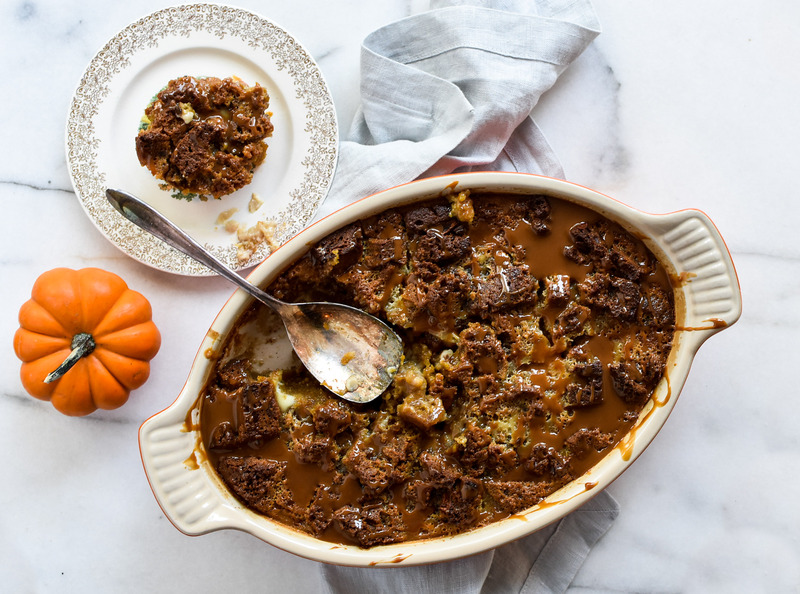 “How about you turn the leftovers into bread pudding?” Oooooooh, I like that idea too. With some kind of sweet sauce on top? I know exactly what to add. 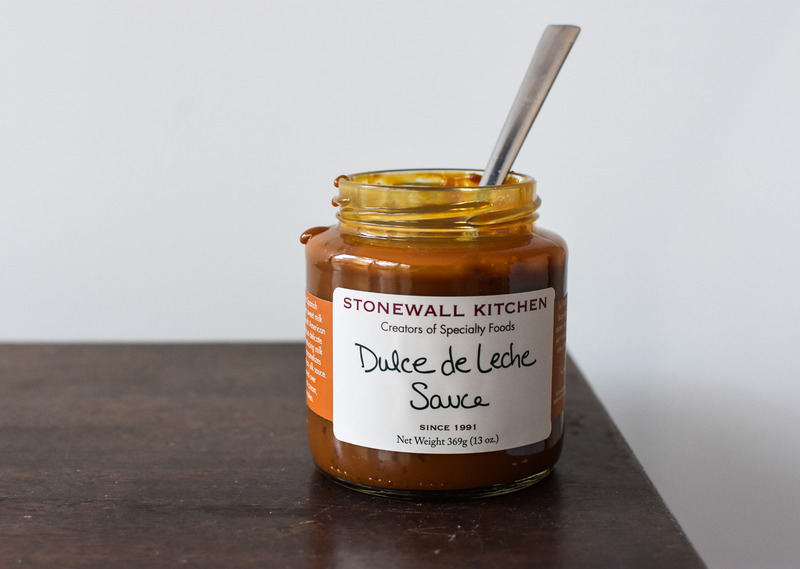 Back to Market Street I go to snag some organic cream, pasture-raised eggs and Stonewall Kitchen Dulce de Leche sauce. 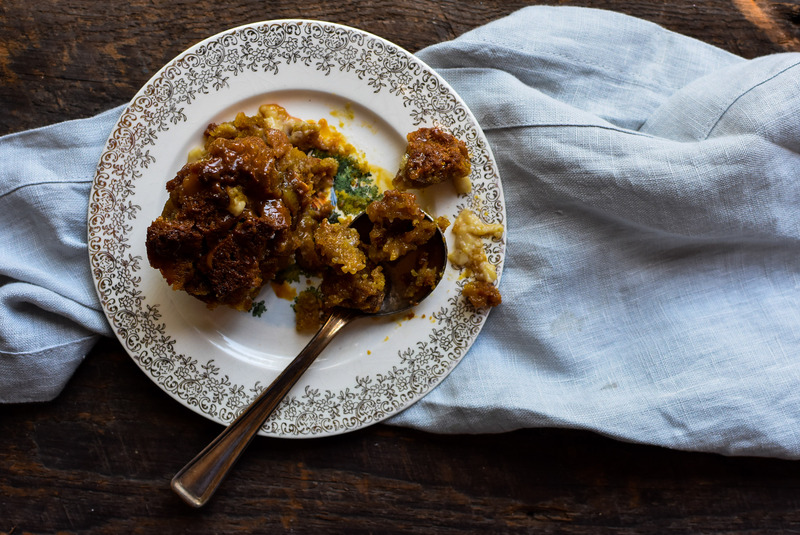 This is going to be the best Pumpkin Apple Bread Pudding ever. “Don’t forget the ice cream!” Disclosure: This is a sponsored post on behalf of Market Street. All opinions are my own and I appreciate your support of the brands/companies that I love. Author note: Be sure to use a smaller baking pan with this recipe. I use a 2.2 quart baking pan. A larger pan (like 9×13) will result in a thin, over-cooked bread pudding that is not as appealing as a thick one. If you cannot find a Dulce de Leche Sauce, your favorite caramel sauce or sweet topping will work. Combine the milk, cream, cinnamon, salt, whole cloves, vanilla extract and sugar into a saucepan. Cook over medium-low heat for 15 minutes, stir occasionally. Do not let this mixture boil. Meanwhile, place the eggs and yolk into a large mixing bowl and set aside. 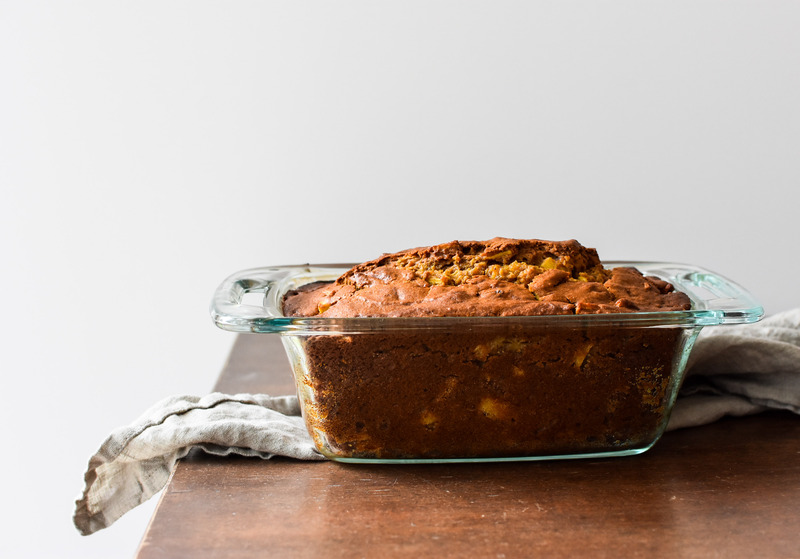 Place the bread cubes into a 2.2 quart baking pan (for Browned Butter Pumpkin Apple Bread, see below). Once the milk mixture is heated, strain it into a bowl. Measure out 2 cups of this milk mixture. Pour the custard over the cubed bread, make sure to evenly distribute the liquid. With your hands, gently press down the bread cubes to absorb the custard and work out air bubbles. 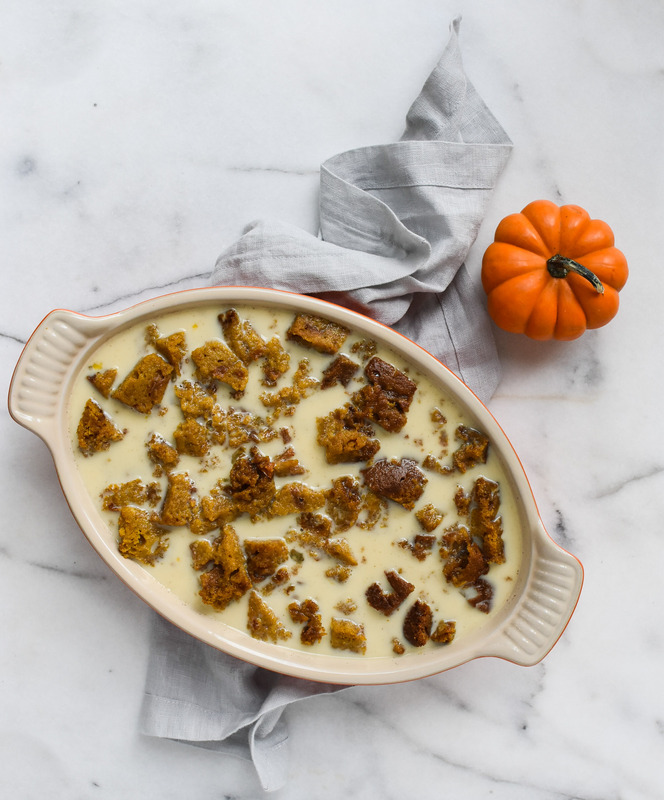 Place the bread pudding into the oven and bake for 50-55 minutes, or until the custard is set. Drizzle the Dulce de Leche sauce over the bread pudding. Serve warm. Author note: If you’re running low on time, don’t brown the butter. 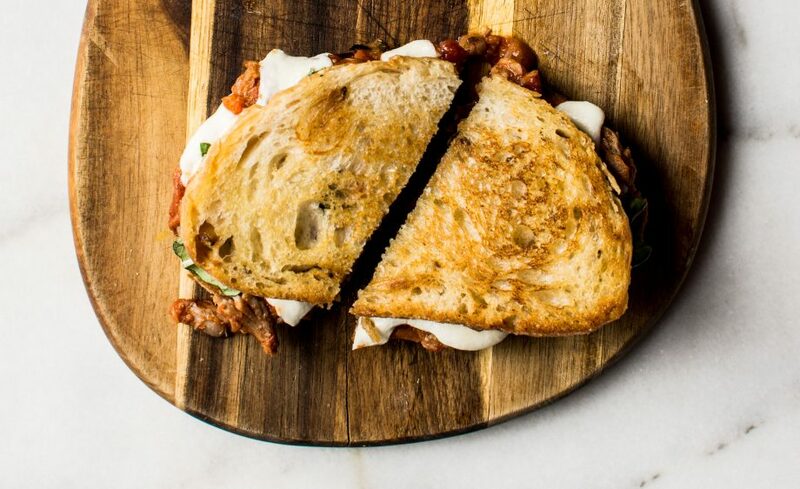 Melt it in the microwave. The bread will not have the distinctive browned butter flavor, but the result is still delicious. The size of the dices are up to you. 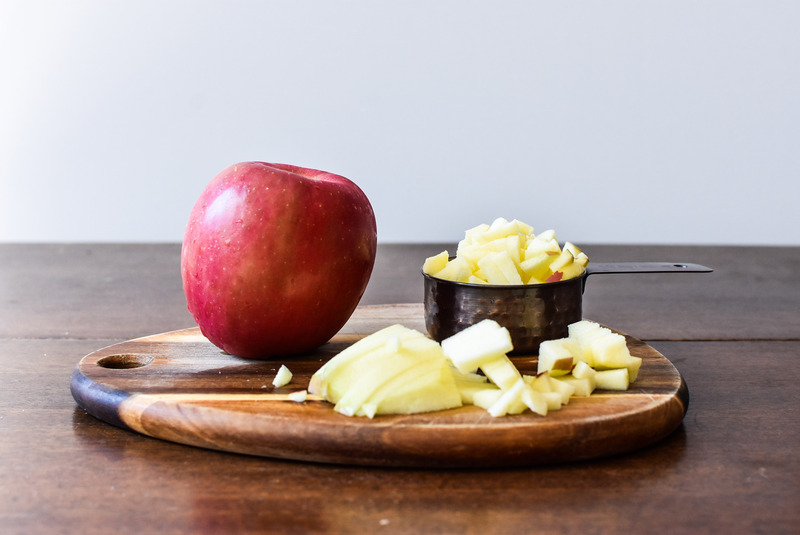 I prefer smaller apple bites. Nuts would also be a nice addition to this bread. However, we are a tree-nut free kitchen due to food allergies and I have not experimented with this addition. Combine flour, cinnamon, kosher salt, all spice and baking soda into a bowl. Set aside. Coat the inside of a bread pan with unsalted butter. Set aside. In four small batches, brown the butter. 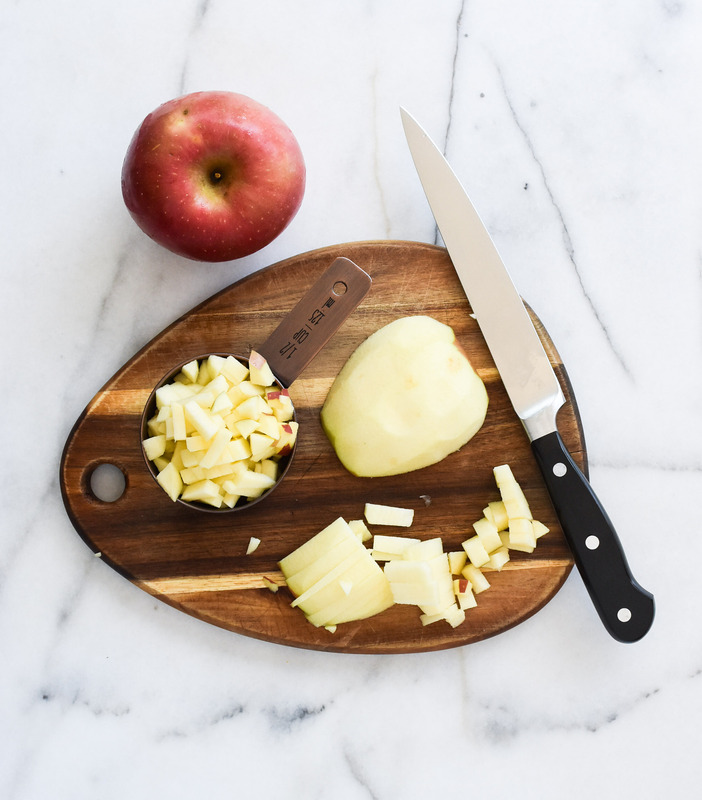 To brown butter, use a large skillet, and heat the butter over medium heat. Cook until the butter is golden brown. Pour the browned butter into a small bowl and continue this process until the 1 1/2 sticks of butter are browned. Let the butter cool slightly. With the mixer still running, add the butter, vanilla and eggs to the pumpkin mixture. In small batches, add the dry ingredients. Continue to mix until all ingredients are well incorporated. This entry was tagged apple recipes, cooking with kids, dallas food blog, dallas food blogger, dulce de leche sauce, fall desserts, make ahead desserts, make ahead dishes, Market Street, Market Street grocery store, Pumpkin Apple Bread Pudding, Pumpkin Bread Pudding, Pumpkin Bread Pudding recipe, pumpkin puree, pumpkin recipes, stonewall kitchen, texas food blog, texas food blogger. Bookmark the permalink.